E-mail is just a click away with your BlackBerry. 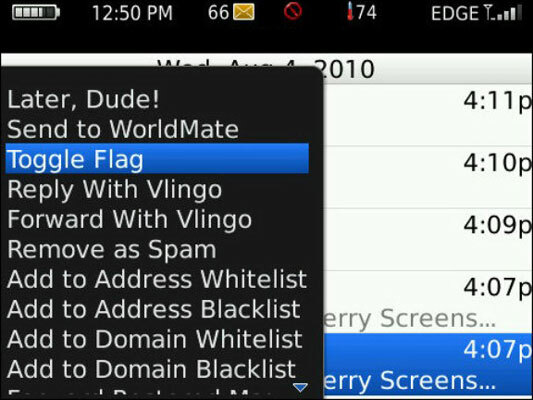 And these BlackBerry apps make it easier for you to send, receive, screen, and organize your e-mails and e-mail accounts. 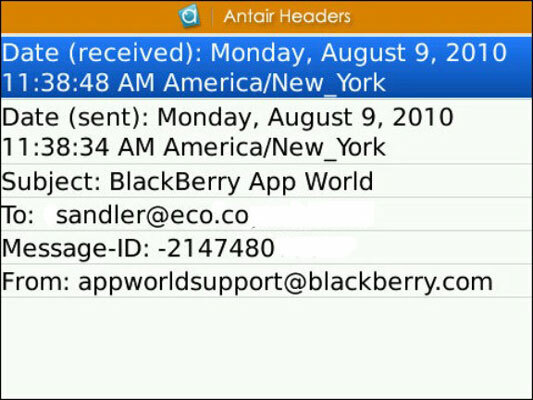 Antair Spam Filter insinuates itself into the BlackBerry e-mail application, integrates with your contacts list, and reads all of your incoming mail. It stops junk where it counts — at the BlackBerry. It begins working as soon as you install it, filtering out known junk. You can, if you choose, fine-tune its operation by adding e-mail addresses or entire domains (the part of an address after the @ sign) to either a whitelist or a blacklist. Sources on the whitelist are always considered acceptable; those on the blacklist don’t get through. You can also add a list of words and phrases to a whitelist or blacklist. The sig is that little snippet of text that goes after your e-mail message. Sig, as in signature. 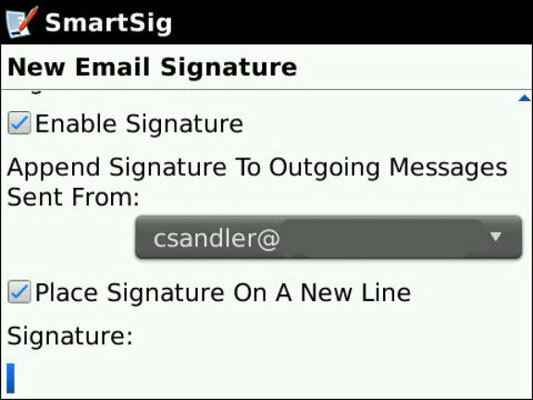 The simple SmartSig app (from Swift Raven Software) allows you to create a whole bunch of different sigs — for different purposes or to customize the response from multiple e-mail accounts you may have set up to funnel into and out of your BlackBerry. If you have only one sig for each of several e-mail accounts that are used by your BlackBerry, you can enable them all and the app will select the proper one to go with the outgoing message. 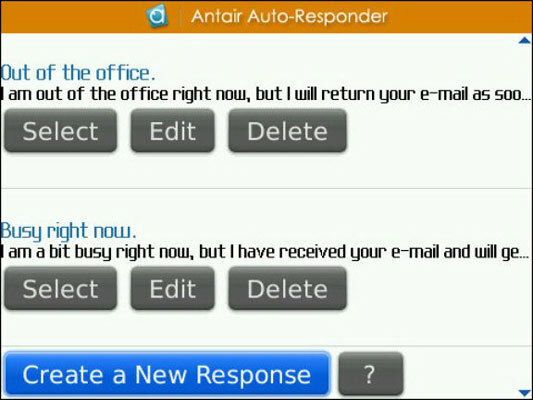 Antair Auto-Responder allows you to create global responses that go to all e-mailers and custom responses that are sent only to specific senders. 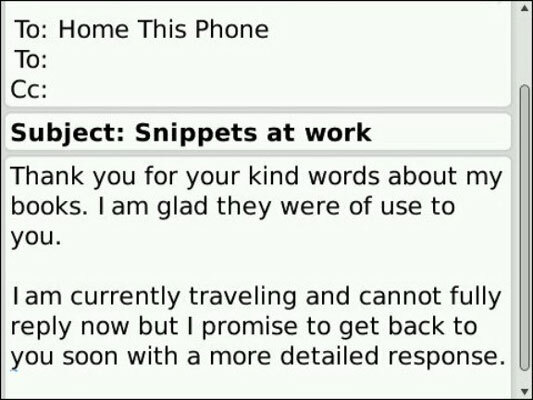 You can use Auto-Responder’s predefined messages or create your own. After you have your responses set up, you can turn them on or off very quickly. Here is a tiny (19K) app from Antair at a great price (free) that gives you just a bit of extra information that may help you analyze the nature of an e-mail and perhaps a bit about its sender. Press the Menu key and select View E-Mail Headers. The screen that appears generally includes the sender’s e-mail address (and sometimes an individual’s or company’s name) and tells you which one of your registered e-mail accounts it was sent to. The Jared Company’s Flag Your Emails . . . flags your e-mails . . . with a nice bright red exclamation point. Now you don’t want to do this on all your e-mails — that would be defeating the purpose. Instead you put a flag on mail waiting in your inbox as a reminder to hold on to it or to do something about it or to otherwise distinguish that message from all the others that surround it. Mail Rule Manager allows you to divert a message from a specific person or domain, or you can make it follow a specific set of rules to discern the difference between wanted and unwanted mail. 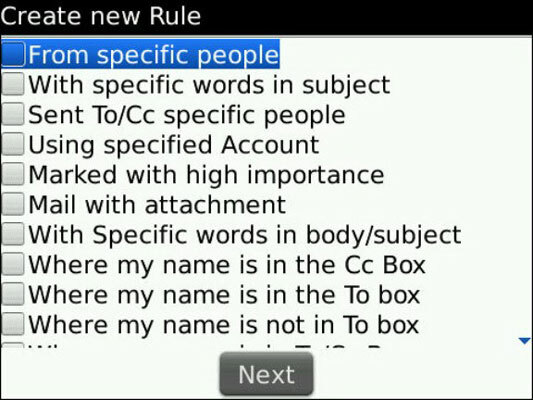 First, create rules, and then tell your BlackBerry what to do with the message. For example, you could tell the app to create a rule that applies to specific senders, messages with specific words in the subject or in the body of the message, or mail that has an attachment. Then you complete the rule by instructing the manager to take an action such as delete, forward, send an auto-reply, or vibrate. Why not use your BlackBerry as a dictation device to send audio messages or even to record a podcast? VR+ Voice, from Shape Services, allows you to record a long spoken message and then send it from your phone as an e-mail. Audio files are considerably smaller (and less expensive to send if you’re roaming) than are video files you might create using the built-in camera of your phone. A one-minute audio recording using this app is about 120K.